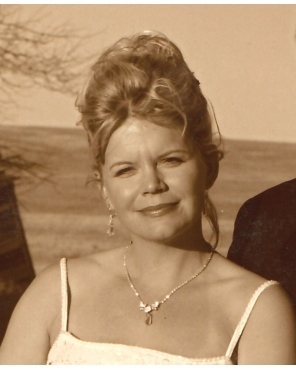 Wendy Sue (Booth) Larson, 51, beloved wife, mother, daughter, sister and friend passed away at her home in Bigfork, MT on Friday, January 11 2019. We will forever cherish Wendy’s zest for life and loving nature to everyone she met. Wendy was born on May 8, 1967 to Peggy Anne and Fred Booth in Great Falls Montana. She joined sisters Lauree and Nan at the family farm north of Highwood. The baby of the family, we loved doting on her and she brought a ray of sunshine to our lives everyday. A delightful child, Wendy was always eager for an adventure, which almost always included many of her animals. She particularly loved her German Shepherd Duke and every kitty ever born at the ranch. Raven, a big beautiful Tennessee Walker entered Wendy’s life when she was 8, and the love of horses was printed on her soul from that day forward. Wendy attended Highwood Schools and graduated in 1985. Wendy was a natural athlete and participated in Basketball, Track and was a Cheerleader for the Highwood Mountaineers. Music filled Wendy’s soul and she shared it with everyone near and far. She sang the National Anthem at numerous events, performed in Country Music Competitions and shared her beautiful voice at hundreds of weddings and community events. Everyone who knew her was at one time touched by her beautiful voice and her love of music. Wendy attended and graduated from Montana State University, Bozeman. She followed in her Mom’s footsteps and became a Bobcat Cheerleader. A member of Alpha Omicron Pi sorority, she brought great joy and friendship to her sisters. Following graduation Wendy married Knox Pilati on December 30, 1988. They lived and worked in Billings and then moved to Spring Coulee Ranch to begin farming. Two beautiful daughters, Abby Jean and Kammi Anne completed their family. Wendy shared her love of animals and wide open spaces with the girls, and a compassion for all things living. She was also an artist and loved creating art with her chidren. Wendy was known for adopting more strays then she could keep and many have been the recipients of her “saving an animal”! She was a wonderful loving aunt to her nieces and nephews and her generosity knew no bounds. Wendy and Knox divorced and she continued to live on the farm for several years. Ryan Larson and Wendy were married in 2002 and began a life of farming and adventure. They enjoyed traveling between Ryan’s farm in Dutton and Bigfork, where they eventually made their home. Wendy loved Bigfork, and her joyous nature and friendliness led her to make many friends in her “village”. Everyone knew Wendy was a true political conservative, a quality no doubt derived from many a conversation with her Dad Fred and super patriot Mom Peggy. She planned her day around listening to Rush and was thrilled to attend the Trump Rally in the Flathead. Wendy and Ryan belong to Bethany Lutheran Church in Bigfork. From a young age, she was faithful to God and loved Jesus. We are comforted knowing she is in God’s loving arms, singing and laughing with her boys. Wendy is survived by her loving husband Ryan Larson of Bigfork, parents Fred and Peggy Booth of Great Falls, daughters Abby Jean Pilati of Bozeman and Kammi Anne Pilati of Missoula. Also surviving are sisters Lauree (Tom) Lingenbrink and Nan (Kirby) Granger of Highwood; nephew Fred (Jacey) Granger, Freddy, Sadie and Collins, nieces Julia (Rick) Haluszka, Ian, Tasha Lingenbrink, and Samantha (Corben) Schedel,. She was preceded in death by twin sons, Michael and Gabriel. Funeral Services will be held Friday, January 18 2019 at 11 am at Bethany Lutheran Church in Bigfork, reception to follow at the church. Wendy will be laid to rest next to her beloved sons in the Choteau Montana Cemetery on Monday, January 21 at 12pm. A reception will follow at the Choteau Lutheran Church. Memorials may be made to the donor’s choice.